Universal decided to do another Arabian Nights-style adventure starring Tony Curtis and Piper Laurie, but this time around they got a dud. 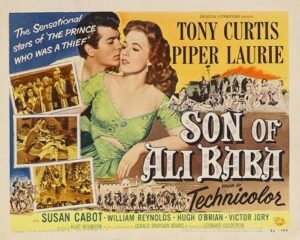 Thanks to his ex-thief father Ali’s vast wealth, Kashma Baba (Curtis) is enrolled with the sons of the nobility as a cadet in Bagdad’s Military Academy—which, except for the dark Curtis, is entirely filled with WASP-looking frat boys straight from the country club. (As usual, only merchants, thieves, and the caliph’s goons look like actual Persians or Arabs.) Kashma throws himself a rowdy birthday party in his opulent Bagdad house in which the caliph’s boorish son gets thrown into Kashma’s indoor pool. Uh oh! Vengeance is sworn, and the next morning Kashma is embroiled in a plot to ruin him and his father by foisting an escaped slave girl, Kiki (Laurie), upon him, only she’s really a princess who’s been promised to the shah unless she can find Ali Baba’s treasure for the caliph to save her mother but it’s impossible to care because this thing is a mess, okay? The only real point of interest in this otherwise dull and derivative exercise is the character of Tala (Susan Cabot), a bow-wielding huntress and friend of Kashma’s youth. At first it seems her only purpose is to make Princess Piper jealous of her connection to Kashma, but then she saves the day several times in succession with her deadly talents at archery. Tala is genuinely intriguing and capable, and how she wandered into this fiasco is anybody’s guess. The rôle should probably have been combined with the princess’s so Laurie would have something to do other than look ornamental, because as it stands, her considerable talents are wasted. Skip this one and watch The Prince who was a Thief a second time instead.